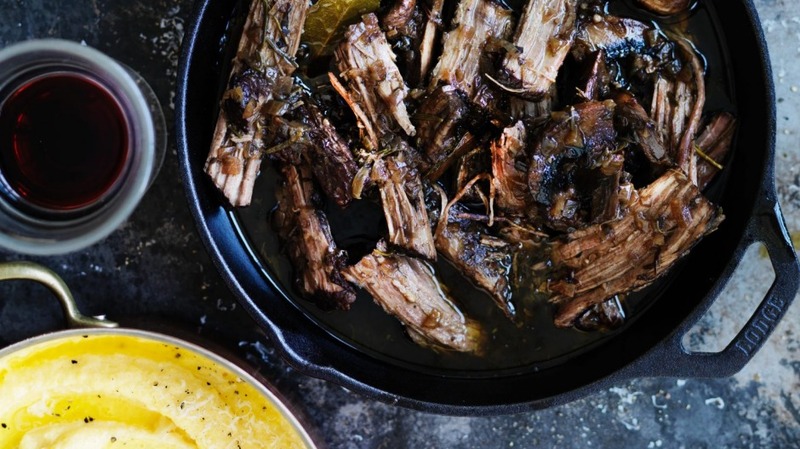 Braises don't get simpler or more tasty than this beef brisket. Cook it slowly, at the gentlest of simmers, and keep the temperature constant. Or replace the brisket with ox cheeks, which are almost impossible to dry out when cooked gently. I have used cabernet sauvignon but any full-bodied wine, such as shiraz, would be perfect. Just add soft polenta and a salad. 1. Season beef with half the salt. 2. Heat a large dutch oven (cast iron casserole dish with lid) on a medium heat. Add half the oil and all the butter. 3. When butter is foaming, add the beef and cook until brown on all sides, about four minutes. Remove beef and set aside. 4. Increase heat and add the mushrooms. Saute for a few minutes then set aside (and reserve any liquid from cooking). 5. Reduce temperature, heat remaining oil then add onion, garlic and thyme leaves with remaining salt. Cook over low heat for 10 minutes, or until onions are soft. 6. Return mushrooms and their liquid to the pot along with red wine, rosemary sprig and bay leaf. Simmer until liquid reduced by half then add stock and bring to a simmer. 7. Return the meat to the pan, cover and simmer for about 2½ hours until the beef is very tender. Regularly turn the meat in the sauce to ensure it cooks evenly. 8. When cooked, remove the beef, and return the pot to the stove and increase heat, reducing to reduce the liquid to until a saucy consistency. Shred the beef into large pieces and return to the pot. Serve in the pot at the table.